The ALT Series largely achieves its aim of a modern, loud and bright take on the all-round classic Turkish-American cymbal. Rides and chinas are particularly aggressive, while hats and crashes are smoother. A good range of all-rounders at a decent price. TRX stands for Turks and the first series of these Turkish-made cymbals, launched in 2006, were simply categorised as DRK (Dark),MDM (Medium) and BRT (Bright). These were followed by LTD, SFX, NRG and BLENDS (blending BRT and MDM) - all pretty self-explanatory. The company was founded by David Levine in Los Angeles with the express intent of importing classically-made Turkish cymbals, cast in traditional B20 bronze, but with a modern twist. 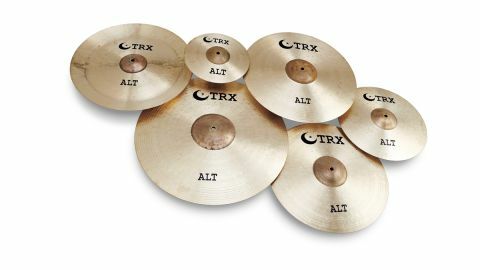 The other smart idea is that equivalent cymbals in each TRX series are offered at the same price-point. We were impressed by the TRX LTD cymbals, reviewed back in February 2009. The ALT, or Alternative series, has also been around since the company's early days and David Levine explains that, "We wanted to create a series of cymbals that would in effect update the general-purpose lines of the 20th Century, ie: Zildjian A and Sabian AA. Those cymbals are great and highly versatile, but we felt that general-purpose cymbals in the modern age needed to be a bit heavier, brighter and a bit more focused to support the newer, more aggressive drumming styles." To achieve this lofty ambition, the ALTs "incorporate thicker, heavier castings, a raw bell and a micro-lathed playing surface with multi-level hammering". The 20" Ride certainly feels heavier than, say, an A Zildjian Medium. It is more on the medium-heavy side. "The shrill attack of the ride separates it from the darker sound of the closed 14" hi-hats. Closing them damps out the higher tones, leaving deeper, warmer, tickier notes." The profile has classic Zildjian-like curves, but the finish is bright and the bronze-coloured bell is unlathed. There is broad and narrow lathing top and bottom, although the bottom has a smoother finish and there are sparse, medium pin hammering spots. All the cymbals have this uniform look, but the crashes and splash are a bit lighter in weight - medium rather than medium-heavy. Starting with the 20" Ride, the intention to create a harder-edged cymbal for the generally higher volume and more aggressive modern music world hits you straight in the face. Stick definition is clear-cut, sharp and high pitched. Yet there is a duality about the cymbal which means that although the first impression is metallic and piercing, underneath there is a deeper tone which adds body and rounds things out somewhat. You can lay into this ride with a thick, big-beaded stick and it takes it willingly. The unlathed bell also has a blunt-edgedclang, while crash-riding is shrill and industrial in its din. Because of the cymbal's weight it also has a long sustain and the after-wash is impressive in its length and sheer volume. "The china's hard-nosed attack dominates the oriental flavour to the point where it loosens your ear wax." The shrill attack of the ride separates it from the darker sound of the closed 14" hi-hats. Closing them damps out the higher tones, leaving deeper, warmer, tickier notes. It is only as you start to open the hats up and splash them about that they, like the ride, reveal their piercing and full-bodied fury. By carefully controlling this dynamic you can extract a wide range of sounds, making them adaptable to many styles of rock and pop. While we're on the modern, bright- focused topic let's get the 18" China out of the way. Given all the above you'll not be surprised to hear that it is a beast. Being thicker than many chinas it is not so much trashy as clangy. The hard-nosed attack dominates the oriental flavour to the point where it loosens your ear wax. Played either way up the edge crash is the same - a brutal crunching exclamation. It rides well too, but approach with care. Turning to the two crashes, the 17" is vivid and fast while the 18" has more presence and depth. They both feel a bit thinner than the ride and so, while retaining that characteristic ALT clarity, they are duskier with a faster reaction and shorter sustain. Overall this amounts to a pair of crashes which are concise and sparky yet also quite warm. The combination of sparkling top with a fuller presence is exactly what you need in a splash to give it substance. And that describes the 10" Splash, which is one of the best such micro crashes I've played. It is lively and sassy, disappearing as fast as it arrives. Playing it is a more-ish experience - tiss-tiss-tiss..